KIM LAWTON, correspondent: On Sunday mornings at New Orleans’ Franklin Avenue Baptist Church, Pastor Fred Luter Jr.’s outgoing personality is on full display. At worship services such as this one that begins at 7:30 am, Luter greets almost everyone in the congregation. And with some 5,000 people attending every week, there’s a lot of greeting. REV. 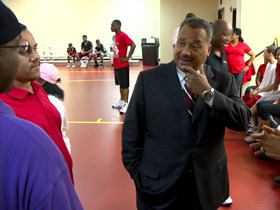 FRED LUTER, JR, Franklin Avenue Baptist Church: I love what I do. I love pastoring. I love pastoring. I love pastoring this church. LAWTON: Luter, who is 55, has been the pastor here more than 25 years. Under his leadership, Franklin Avenue has become one of the largest Southern Baptist churches in the state. That takes many people by surprise, because Franklin Avenue is predominantly African-American, and the Southern Baptist Convention is about 80 percent white. The fact that Luter is likely to be elected the next president of the SBC is even more surprising. LUTER: It’s a new day in the Southern Baptist Convention. Our doors are open to each and everybody: African-Americans, Hispanics, Asians, no matter the color, no matter the creed, no matter the background, this convention doors are open and our churches are open to whosoever will, let them come. LAWTON: At one time, Franklin Avenue was an all-white Southern Baptist church. But in the 1970s, whites moved out of the neighborhood, and the congregation changed. A New Orleans native, Luter grew up in a black Baptist denomination. When he arrived at this church in 1986, there was some debate about leaving the SBC. He convinced the congregation to stay. LUTER: I knew this convention had a heart for evangelism, had a heart for discipleship and had a heart for reaching people in, in difficult times, and I felt this is the right place for us. Not even knowing what would happen years later. LAWTON: The SBC was formed in 1845 after a north-south split over slavery, and the SBC long supported slaveholders and segregationists. In recent years, the convention has adopted resolutions of apology for those stands. LUTER: I have a past, you have a past, everybody has a past. This convention unfortunately has a past that we’re trying to move forward from and, and that’s how I look at it. There was apology made, and so it’s now time to move on and that’s why I’m excited about this opportunity. LAWTON: Still, Luter acknowledges that racism is an ongoing issue that needs to be addressed, in the denomination and across the nation. For example, he says while he doesn’t agree with all of President Obama’s policies, he has been troubled by what he sees as a lack of respect for the president in many quarters. LUTER: A lot of the things that this president has faced has not necessarily been because of his politics or his decisions, but unfortunately it’s just only been because of the color of his skin. And that’s what lets me know that we have a long, long way to go in America as far as racial reconciliation. LAWTON: Ongoing tensions over race, he says, can’t be ignored. LUTER: As long as those kind of things keep happening and the Trayvon Martin thing in the Florida situation like that, we have to deal with it. Even some things maybe within the convention that we need to talk about and address. REV. DAVID CROSBY, First Baptist Church, New Orleans: I’m not pretending like Fred’s election to the convention now is going to do away with all racial tensions in the Southern Baptist Convention or anywhere else. That’s not going to happen. But it is going to be a step, and I think a major step, in the right direction. LAWTON: At the SBC annual meeting next month, Rev. David Crosby will be the one to officially nominate Luter as president. Crosby is pastor of a predominantly white Southern Baptist Church in New Orleans, First Baptist, and has become close friends with Luter. CROSBY: I trust him. His presidency is not going to be about him. It’s going to be about the health of our convention. And we need his help. We need his perspective. We need his wisdom. LAWTON: The two pastors’ friendship was forged in the difficult days after Hurricane Katrina. Franklin Avenue Baptist Church had been devastated by the storm. Months after Katrina struck, volunteers in protective suits were still trying to clean out the sanctuary. 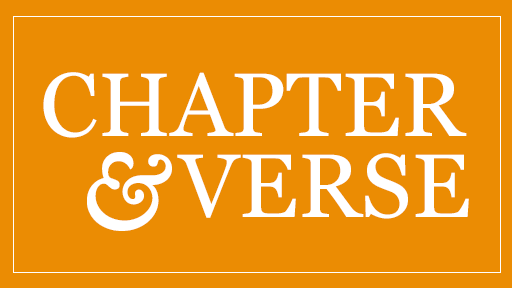 LUTER: To come here and see this, this church that God allowed me to pastor, we built this church and—beautiful–and then coming here, and we see pews thrown all over, the mud thick, the smell, the stench, it just, I just, I cried like a baby. LAWTON: The church had to be completely gutted and rebuilt. Most of the 7,000 congregation members had fled from New Orleans, but the remaining 50 or 60 needed a place to worship. First Baptist, which had sustained much less damage, opened its doors, and the two congregations shared the space for nearly three years. The two pastors, who didn’t know each other well before that, ended up partnering on several projects, such as a 2006 visit to New Orleans by Billy and Franklin Graham. CROSBY: It broadened our perspective of our own faith, broadened our perspective of the church of Jesus Christ and how we can work together, helped us understand across ethnic and cultural lines who we are together as brothers and sisters. LAWTON: After years of construction, Franklin Avenue moved back into its rebuilt church in 2008. But the relationships between the pastors and the congregations continue, such as a recent joint mission trip to Africa. Crosby says while Luter’s preaching skills are lauded across the SBC, working so closely together showed him that his friend’s gifts extend beyond preaching. CROSBY: He’s able to articulate a vision and present it to the congregation or to people in such a way that they buy in. 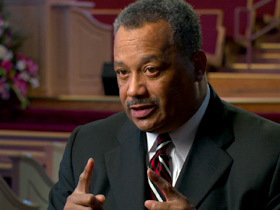 In every aspect imaginable, Fred Luter is qualified to be president of the Southern Baptist Convention. 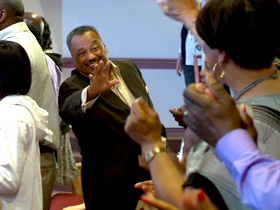 LAWTON: If he indeed becomes president, Luter says in addition to encouraging the establishment of new churches, one of his goals will be to support local congregations that are struggling to survive. LUTER: We really have to work with a lot of the churches who are already existing but are hurting. They haven’t baptized in a while. They’re not reaching people, and we need to go into these churches and find out what can we do as a convention to help you get back on your feet? LAWTON: As president, Luter would also help give voice to the SBC’s often-conservative stance on public policy issues, such as opposition to abortion and gay marriage. He says that’s something he doesn’t shy away from. LUTER: We’ve always been out there on the front lines and we don’t mind that. We don’t mind because we believe in standing up for what we believe in and so there’s some things out there that’s going to have to be addressed. My mindset and my lifestyle is driven by what the Word of God says. If God says it’s wrong, then it’s wrong. LAWTON: He’s aware that as the first African-American up for the SBC presidency, he’s disproportionately in the spotlight. LAWTON: He says it’s Elizabeth, his wife of 31 years, who helps keep him spiritually grounded. LUTER: I call her the love of my life, the apple of my eye, my prime rib, my good thing, that’s how I introduce her. She has a very unique relationship with God that I envy and admire, and she is one that keeps me level headed, she keeps me from getting a big head, but also she keeps me connected to God. She’s, she’s my accountability partner. And there are people that I maybe can fool and get over on, but I can’t with her. LAWTON: As the convention meeting approaches, Luter says he’s praying more than ever for wisdom. LUTER: Cause I’ll be speaking on behalf of a denomination of 15 million members. 15 million people of over 45,000 churches, and so I want to make sure that I represent not only them well, but most of all I want to represent God well. 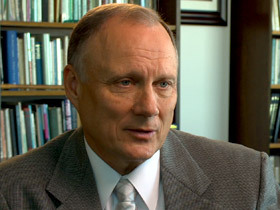 LAWTON: He says what he wants people to know him for is helping the SBC live out the teachings of Jesus. LUTER: My number one hope is that they, when this is all said and done, that they can look at the fact that here was somebody that brought this convention closer, not necessarily just whites and blacks, Asians, Hispanics, but, but the young and the old, the yuppies and the buppies, that we can all come together and say let’s get back to making the main thing the main thing.